Tablets and 2-in1 devices have been available for many years now and, to be honest, we rarely see something truly innovative. 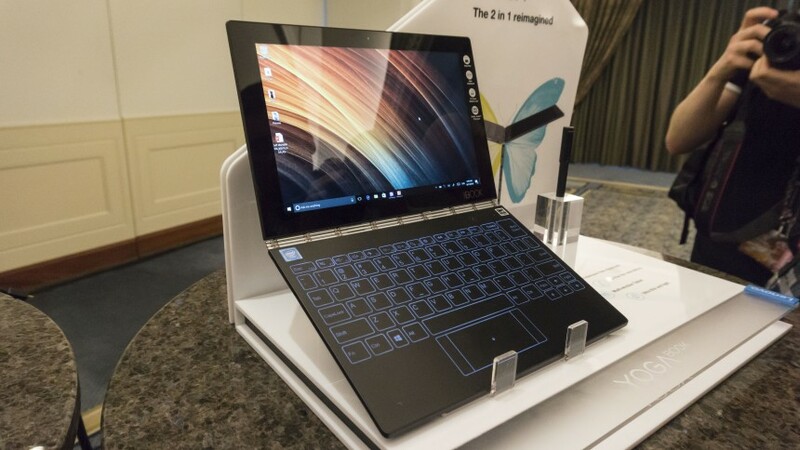 But Lenovo (lenovo.com) want to change all that with its multi-format, multi-purpose Yoga Book running on Google Android 6 or Microsoft Windows 10. 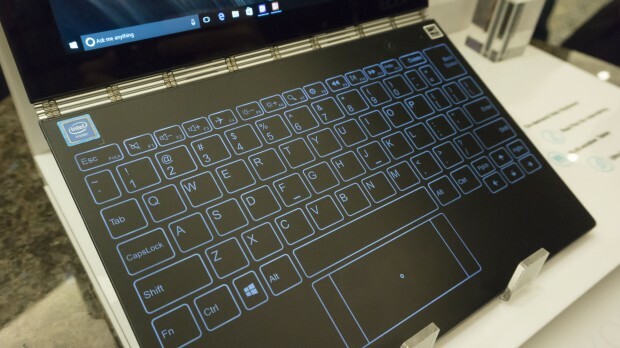 Lenovo’s designers have gone for a classy elegant style. 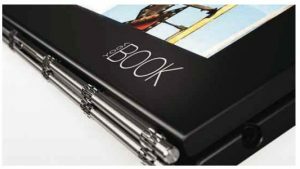 The Yoga Book’s black magnesium aluminium chassis is silky to the touch with just a hint of graininess – a little like one of those expensive those expensive Moleskine notebooks. And it’s both light and super slim. It weighs just 690g, or 1.5lbs, and at 9.6 mm it’s much thinner than the Apple Macbook or a Microsoft Surface Pro 4 with a type cover attached. Taken together it means the Yoga Book it’s easily small enough to carry around anywhere, yet it retains the sturdiness of a full laptop. A key reason for this sturdiness is the silvery aluminium watchband hinge, first seen in the Yoga 2-in-1 notebook/tablet range. Six mounting points give structural strength and a solid, dependable feel. This stylish watchband hinge looks great and has a smooth yet solid action. The mechanism allows for virtually 360 degrees of motion but holds its position wobble-free at any angle. This means the device can lie completely flat on a table or be put into tablet, laptop and ‘tent’ orientations. When opened up with the power off, you’ll have two near identical panels. The top one functions as a 10.1″ screen with a native resolution of 1920×1200, but as we’ll see, the bottom panel has a few innovative surprises. Use the wristwatch hinge to fold the bottom panel back under the screen panel, power it up and you’ll have a reasonably thin and light tablet in your hands. With its responsive capacities touchscreen, it does all you’d expect from a tablet running Android or Windows. When operating in laptop mode the second panel turns into an illuminated, capacities-touch keyboard with haptic feedback, plus a smallish 66mm x 33mm capacities touchpad. How you’ll rate typing on a flat panel rather depends on your previous experiences and preferences. Touch typist won’t be happy. Firstly, the 10″ tablet format means the keyboard layout is a little more cramped than usual. And the buzzy sensation produced under your fingers by the haptic feedback isn’t the same as having keys that actually move when hit. In laptop mode, the second panel turns into an illuminated, capacities-touch keyboard with haptic feedback. However, for those used to entering text on touch-screen smartphones or iPad keyboards this isn’t an alien experience. In fact, with the haptic feedback it may well turn out to be a step up from what they’ve been used to on those devices. And the Halo keyboard does make it possible to perform standard Windows shortcut operations such as cut/copy/paste. Plus you can adjust the brightness of the keyboard, the strength of haptic feedback and the touch tone. But the Yoga Book is much more than a tablet, or even a typical 2-in-1 tablet/laptop device. A simple press of the pen Icon, located next to the camera on the keyboard deck, activates Lenovo’s proprietary Create Pad technology. 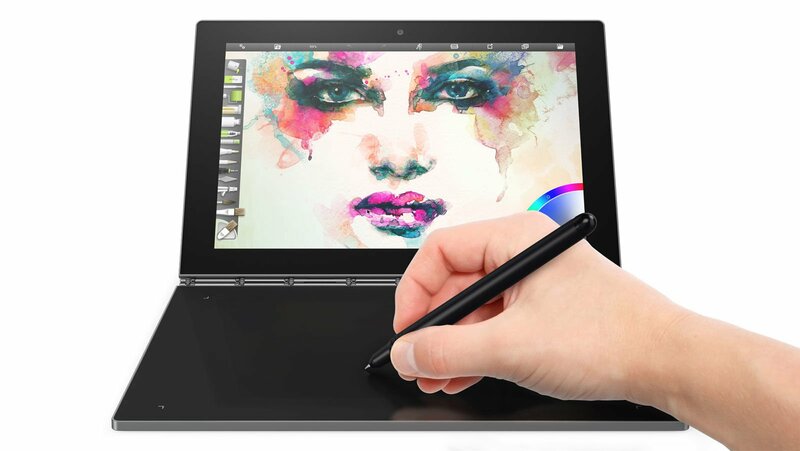 Implemented as a hardware layer underneath Halo keyboard it’s effectively a Wacom digitize, supporting up to 2,048 levels of pressure sensitivity. Draw or write on the Create Pad using the supplied Real Pen stylus and your analogue stylus movements are captured and converted into digital signals, then displayed onto the screen via the dedicated Create Pad mode app. The stylus itself has interchangeable tips. One is just a standard plastic stylus pointer, but switch this for an ink filled tube and you’ll open up yet more creative possibilities. Inserting an ink filled tube into the stylus effectively turn it into a ballpoint pen, but it has far more potential than the classic Biro. To put it to use snap the Book Pad, essentially a paper notepad, onto the keyboard/Create Pad panel. It’s held in place by magnets so it lines up perfectly with the underlying digitiser. The Book Pad transforms the Yoga Book Into a handy digital notepad, able to capture notes, diagrams, sketches and doodles. The paper inside Book Pad is good quality and should help the inking-mode stylus lay down smooth marks. Early reports suggest the digitization is very accurate, reproducing every little mark, crossed’t’ and dotted ‘i’. On a windows machine the OneNote app would make an excellent choice, especially when it’s synced to a OneDrive account. However, there are other Windows pen-friendly apps, such as the Post-it note look alike Sticky Notes. Arty examples include Sketchpad and Screen Sketch, which capture the display as an image ready for annotation. Other pen-supported apps on the Windows Store include Graphiter, Notebook Pro and Sketchable. Incidentally, you can use any paper instead of the Book Pad, but if the paper moves part way through a sketch or written note then the output probably won’t come out as quite how you expected. Inside, the 2.4-GHz Intel Atom X5-Z8550 processor is nothing special, but it is on a par with similar devices, such as the Microsoft Surface 3, while the Intel HD 400 Graphics GPU is fine for video watching and casual gaming. This class of power means the shell shouldn’t get too warm. The 4GB of RAM and 64GB of eMMC storage are also pretty much what you’d see in competitive offerings. Wireless communications are handled by its 802ac wi-fi and Bluetooth 4.0 chip sets. As for ports, there’s a single mlcro-USB, micro-SD and micro-HDMI plus a headphone/mic. There’s an eight-megapixel camera on the rear and a two-megapixel one on the front. Both offer an HDR mode to help achieve rich colours and sharper contrast in tricky light conditions, while early adopters suggest the built-in Dolby Premium speakers output a remarkably clear and loud sound considering the ultra thin dimensions. Lenovo claims that the Yoga Book lasts up to 13 hours on a full charge, but on past performance this usually relates to around 10 hours of normal usage. Yet this is more than enough to beat the typical real-life battery life of rivals like the Microsoft Surface 3 and Dell Inspiron 3000. As of early November the Windows 10 version of the Yoga Book is priced. However, the Android 6 version is substantially cheaper, even though the hardware specifications are identical. In fact, the Android option does have a special trick: you can actually take inked notes with the screen off. At time of writing this isn’t possible with the Windows version, though this anomaly might be resolved at some point. Go for the Windows 10 version, and as well as the Create Pad and Book Pad software you’ll have the usual Windows 10 apps such as OneNote and Office Mobile Word/Excel/Powerpoint. There’s also a trial of ArtRage Lite, plus Netflix, Pandora, Twitter and a number of games like Candy Crush Soda Saga and Farmville 2: Country Escape. The Android option does have a special trick: you can actually take inked notes with the screen off. As you’d expect a keyboard is essential to get the best out of Windows 10. Therefore we recommend you try out the capacitive-haptic-touch Halo keyboard on a demo machine before deciding to buy. Lenovo (lenovo.com) is a Chinese technology company with headquarters in Beijing and the US state of North Carolina. It designs, develops, manufactures and sells all kinds of office and mobile products for the consumer and business domains. Lenovo acquired IBM’s personal computer business in 2005, including the ThinkPad laptop and tablet lines, for $1.23 billion plus an additional $500 million of IBM’s debt. This move made Lenovo the third-largest computer maker worldwide by volume and in 2015 it became the world’s largest PC vendor by unit sales. Since then it has enhanced the ThinkPad laptop lineup, which is notably the only laptop certified for use on the International Space Station, and Lenovo’s 2-in-1 Yoga range has been a bit hit. Especially the Yoga 3 Pro and Yoga 900 models with their 3200 by 1800 pixel resolution 13.3-inch touchscreen, an innovative ‘watchband’ hinge that facilities laptop, tablet or ‘tent-style’ video-watching configurations and the ultra-sleek 13mm thin body dimensions. Lenovo also has a smartphone product line, which includes the first Google Project Tango phone. It also acquired the mobile phone handset maker Motorola Mobility from Google in October 2014. Plus there’s a Lenovo smartwatch branded as a ‘Smartband’ with a seven-day battery life. As for a line of business-oriented products it has the ex-IBM ThinkCentre desktop range, which consists of midrange to high-end processors with options for discrete graphics cards and multi-monitor support. There’s also the ThinkServer product line developed using single-socket and dual-socket machines based on IBM’s xSeries technology. By default the Android 6 operating system doesn’t have the same range of apps you’d find on the Windows version. To help even things out Lenovo bundle in a number of additional apps that help take advantage of the Yoga Book’s artistic and note-taking capabilities. Of course, being bold does have its risks. Especially if your innovations go to market a little too early. You only have to think back to Apple’s failed touch-interface Newton, which was eventually superseded by the iPhone/iPad around a decade later. With all this innovation it’s not too surprising to see the Yoga Book isn’t especially cheap. If you are primarily interested in its pencentric note taking capabilities spending or even isn’t a trivial sum – especially when you can still get a Microsoft Surface 3, and the cheapest Surface Pro 4 isn’t much more. But we are entering a time of extreme pricing volatility thanks to the falling value of sterling against the US dollar. Apple announced substantial price hikes across its MacBook range at the end of October. Microsoft and others are expected to follow suit. 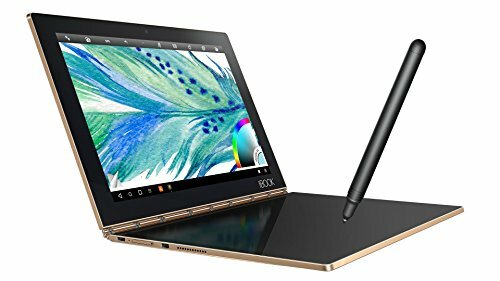 Consequently, in 2017 the Lenovo Yoga Book might look much better value. Are you impressed by the Yoga Book’s capabilities? Would it be something you’d consider buying yourself?